Gearless moto-scooters have come a long way from their image of 'light and cheap female alternative for a motorbike' and metamorphed into a unisex vehicle which is easy to store and light on the road. After the immensely popular TVS Scooty, which gave a rather effeminate look on the road, TVS Motors brings the Unisex TVS Wego, which comes with features that most other gearless scooters manufacturer's didn't think of all this while, which could prove to help Wego earn its own fan base. The 110cc, all aluminum bike that TVS Wego boasts of, is capable of rendering a maximum power of 8bhp at a speed of 7500rpm and a maximum torque of 8Nm at a surprisingly low range of 5500rpm, which gives the user the confidence to drive in low gears, especially in heavy traffic. This four stroke vehicle is assisted by the "Digital IDI Technology" which was incorporated in the Apache model of motorbike of this manufacturer. It also renders a reasonable mileage of around 50 kmpl. Anyone who looks at the all metal wonder known as TVS Wego from the font would definitely be impressed, as most of the modifications are in front, giving the vehicle an overall aggressive look. Another feature that stands out the fact that Wego has the industry's first 12 inch alloy wheels on this scooter. While these add to a lot of safety on the road they also give it a rather distinguished look. The bulging rear ending with a pointed tail adds to the overall styling. This machine also comes with combo chargers where the rider can charge his or her mobile phone. TVS Wego has been designed in such a way that its centre of gravity is exactly - yes, precisely - in the centre of the vehicle, which proves that the front and rear portions of it are well balanced and the weight is evenly distributed. This quality, in turn, renders greater control and maneuverability to the rider. 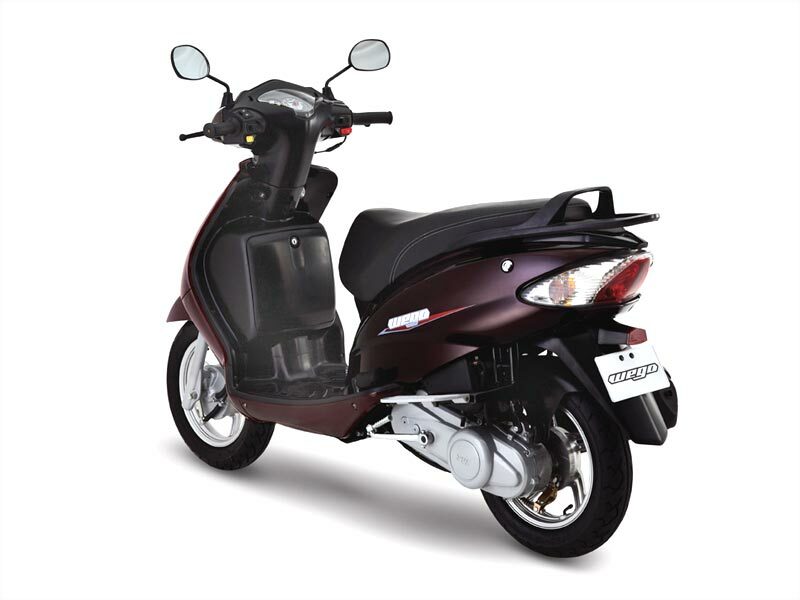 The Wego is also equipped with the Gas Filled Rear Shock Absorber and the Telescopic Front Shock Absorber to balance the unevenness on the roads and are responsible for a smooth ride in almost all conditions. 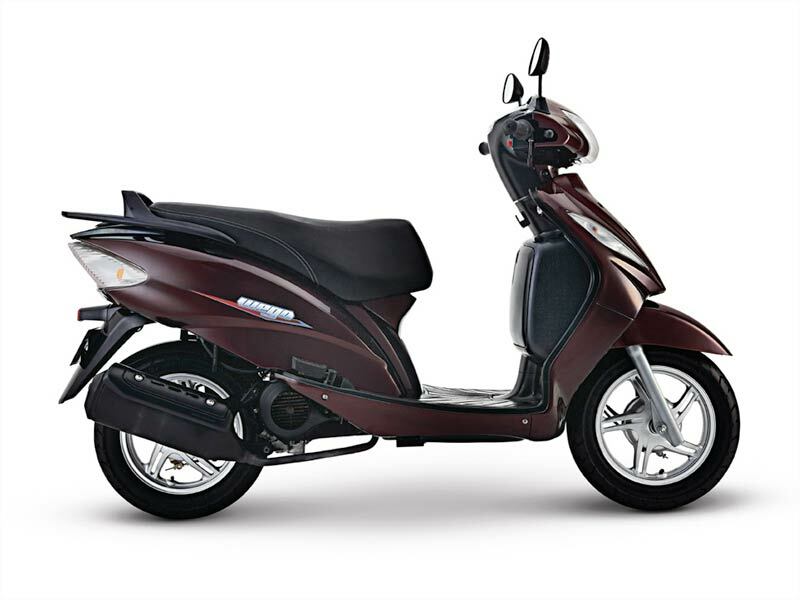 As an additional feather in the cap of gearless scooter group, TVS Wego delivers an average mileage 45-50 km/l. 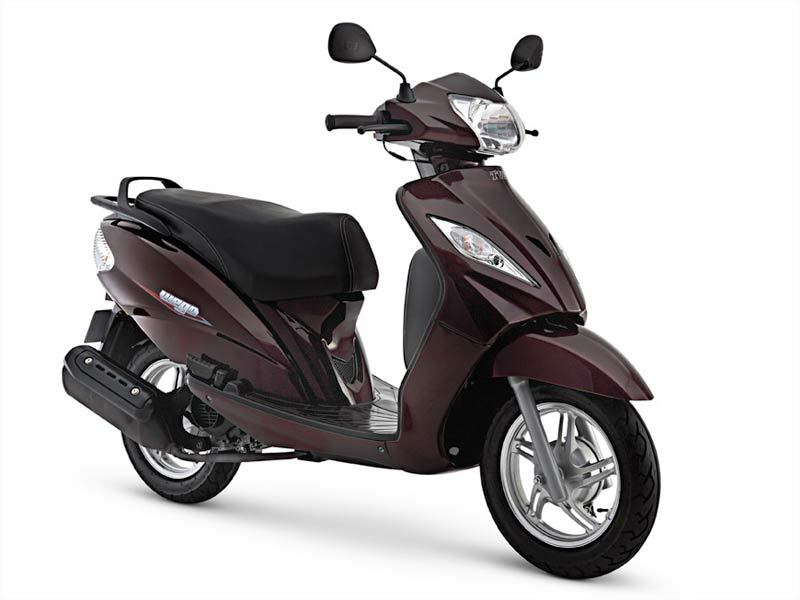 To accommodate colour choices of both the sexes, TVS Wego is available in M,etallic Silver, Bold Black, Royal Blue, Champagne Gold and Cappuccino Brown. As per the Ex-showroom prices in Chennai, the TVS Wego is priced at Rs. 42500.